the best of intentions... I will brief you on my very busy fall thus far. Sports what I have been up to. Taxi is my new name. I am a mom taxi. I have spent more time in the local high school parking lot than anyone I know. Dropping off and picking u up, waiting and waiting. Like right now, I am waiting for one child to finish up practice. And if the other wasn't so sick they'd be getting droped off for their practice. I know I know. Some of you don't like the sports thing or maybe just don't do it due to various reasons. And I get it. Believe me. I do. I never thought this would be our path. But let me tell ya, my husband was a sports guy-not a jock- just naturally athletc and involved in any sport available. And guess which side my kids take after in this department? Its ok. I get it, but seriiusly the back and forth multiple times a day and throw in church, piano and the occasional dash to the corner market for milk , and I am so do g tired by the end of the day. I know someone out there gets it, right?! So I'm just keeping it real today. I am tired Repeat. I. AM. Tired. The lovely wild ones and they're furry pets kept me up last night. It all started after Dad went to work and all the kids wanted to sleep with me. Sure. Why not? Because who doesn't want to share their bed with a gaggle of wiggly monsters? After about an hour and a half of putting up with one of my daughters wiggling I finally kicked her out of bed. Oh wait! First she had a bad dream that's right. It's all coming back to me now. She comes in Mom's bed. I start to fall asleep. Now it's past midnight and I finally kick her out and just have the baby with me. Finally, some sleep. About an hour later give or take, the new puppy starts howling downstairs. Did I mention he is a bloodhound? So when I say howl I mean HOWL! Since he doesn't stop. I assume he's in distress. I trudge downstairs in the dark, look at him in his kennel and observe nothing is wrong. He must be seranading me while i sleep. How thoughtful! I let him out anyways. The puppy and the big dog go outside in the dark to do their business while I stand there wondering if I should just leave them outside for the night or if I should wait.. What time is it anyways I wanderd to the clock. And is 3 AM people, 3 a.m. and I have slept maybe an hour. I go outside to call and beg the puppy to come in. The big dog is already inside and curled up on his pillow. The puppy is running wildly around the pool. I can't see him very well. I see him come arounnd the corner and scamper off again. I time it just right the next go round and grab him as he comes around again. Good gravy dog, its 3 am and you have the energy of a jackrabbit. Dogs come in, I go upstairs. I fall to sleep for the third, fourth time I don't even know anymore. The baby,that's right she still in bed with me, wakes up and has wet the bed. My bed! I give up! She scampers off to the bathroom to change, & I throw a towel over the damp sheet because at this point I am just too tired to care. Don't judge! Finally, sleep. For maybe an hour or two until my alarm goes off and its time to get ready for another day. And that folks is why I am tired. Today I woke up and there were ants all over my kitchen counters. I can't even tell you how grossed ou I was! The creepy, crawly little critters even falling from the ceiling. They were everywhere! And I started to wonder what kind of ants I have in my life. Jealousy, bitterness, anger. All these things that crawl into my life, take over my feelings and bring out the worst in me.. things that fall over me when I'm stressed or worried or feeling overdone from pouring it out out into everyone else every single day. See I told you my inner thoughts were turning into a blog post! As I was cleaning up the dead black little bodies scattered all over my counters I took a moment to actually pray. For joy. For peace. For calm in the midst of the storm of the mundane everyday pouring out and filling a little buckets of the little people who depend on me every single day. I can't let the little ants take over my heart. My soul. My feelings. I don't have time for little ants to creep in and fill up my thoughts with negativity or take over my mind and lead me down the wrong path. I need more joy I need more peace. And the only way to be filled with that is to go to the Source. He's the source d. My lifeline in those crazy, chaotic stretching days that makes me wish for more coffee or chocolate. It's been years.....YEARS since I've blogged. Life has been so busy....I'm sure everyone's has. And I now have a teenager, two tweens and a preschooler...so there. So I may not be consistent, but it seems like my inner mono log is always in blogger mode. So maybe. Maybe I will try again. I never thought I'd be that mom. You know the one driving every one to every thing, every day (not really, but it feels like it some weeks). Spending all afternoon in the SUV (or mini van, or whatever..) Throwing Goldfish to the littles in the 'way-back' seat to keep them happy, and turning up the radio when U2 starts playing. And did I mention it's SUMMER?!?!! I thought things were supposed to slow down in the summertime? We have had more lessons and practices and volunteer time and VBS and day camps in the last month than we had all school year! On more than one occasion, I have driven 30 miles one way, twice in one day, for certain children's sports equipment and practices. Certain children who think it's my duty to drive them here and there with nerry a thought as to my own plans of reading a few more chapters, or attempting something that resembles yard work in the pitiful weed pile we call a backyard. Certain children who are the reason I stash chocolate in the fridge behind the butter, and greedily sneak it when they are in the pool. (Shhhhhh....) It's been good,. Busy but good. And it's going to keep up at this pace til school starts. COME ON SEPTEMBER! But isn't that what I signed up for? Isn't that part of being a mom? I guess it is. If you have kids, life gets busy. Life gets messy, unorganized and chaotic. And that's ok. As long as I can get to my chocolate stash in time before the meltdown begins. My melt down, not the preschooler's! A wise pinterest pin says, "All I need is chocolate and a whole lot of Jesus" And that's the truth. Our Co-op had a fun 'Country Report Night' we participated in. At first our kids picked the Czeck Republic because of a suggestion from Daddy. His ancestors way...WAY back are from there and he thought it would be cool to learn about his roots. So we looked it up. After not being able to pronounce most of the names and places and seeing how the history of that country would be really difficult to understand; the kids all threw up their hands and said 'Australia' !!! What a fun country to learn about. We briefly covered the history of Australia and how the Europeans began settling there. It is a bit of a sad history-much like America in how it treated the native cultures. We also studied the things that make Australia unique to the rest of the world. It was an exciting study and all of our children really enjoyed it. Most of the information is the same in each book. We made a map, covered the flag, the difference in our time zones, the boomerang--a really cool study in itself--and of course some of the unique parts of Australian culture. Here is their coat of arms and a fun little 'treasure map' activity and a compass. 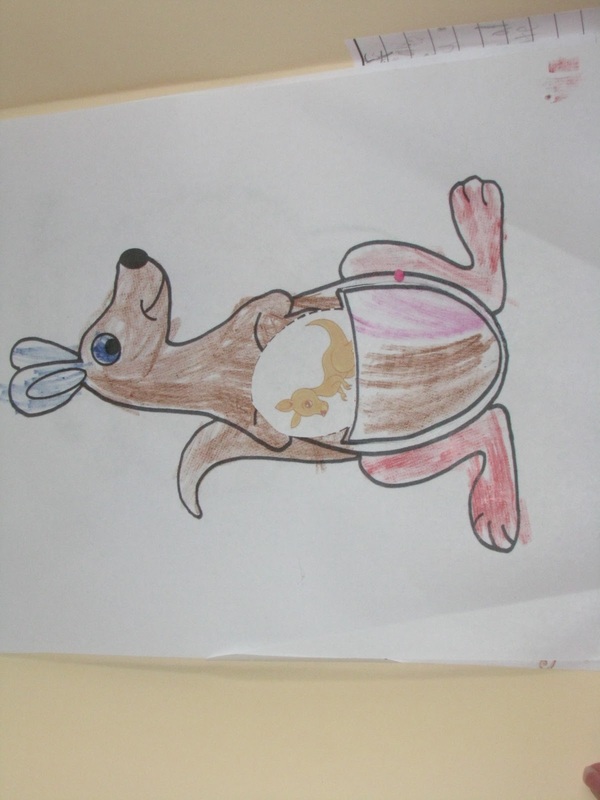 Another little craft our 1st grader did--a mamma kangaroo and her baby joey. Some cool Aborigine art work too. Their favorite part of the study by far was the animals. We made some cool animal cards and read about each one and copied information on the back. Then at the end o f our study we had our Report night with our co-op. Each family did a report on their chosen country and presented it in front of the group. Our kids were the last ones to do theirs. Finally when their turn arrived, they presented their report and showed off their lapbooks to everyone. Each family also brought a dish and dessert to share and we had a multi-cultural potluck. We made Shearers Pie which is basically a combination of scalloped potatoes and shepherds pie. It was super yummy. Lammingtons was our dessert. You can't go wrong with cake dipped in chocolate and then rolled in coconut. WOW, that was G.O.O.D.!! Most of the components for our lapbook is from Teacher Book Bag that I purchased on currclick.com Some are from homeschoolshare.com. Every kids wants to do it, right? We finally made our very first Volcano! After studying volcanoes for our science project this year, we gathered our materials to create our personalized version of these monstrous beasts. Depending on which child you ask it is a different volcano. One says it's Mt. St. Helens, the other says it is Olympus Mans on Mars--which we studied in our Apologia astronomy studies this year too. Either way, it worked. First we mixed the two substances (baking soda and vinegar) in a soda bottle and closed it off with a cork made of a chunk of a potato. Weird? Yes! But the idea was to be able to watch the build up of gasses and bubbles and see the cork blow off, much like some volcanoes have a sort of plug covering their tops. Did you know that? I didn't!! One more reason I love homeschooling--I learn right along with them too. So yes, the cork popped and we tried several different combinations of soda/vinegar to get more of an 'explosion'. Finally we made our paper mache volcano. FUN, FUN!! We have never done paper mache, so this was a fabulous sticky, glue-y mess. The kids loved it! 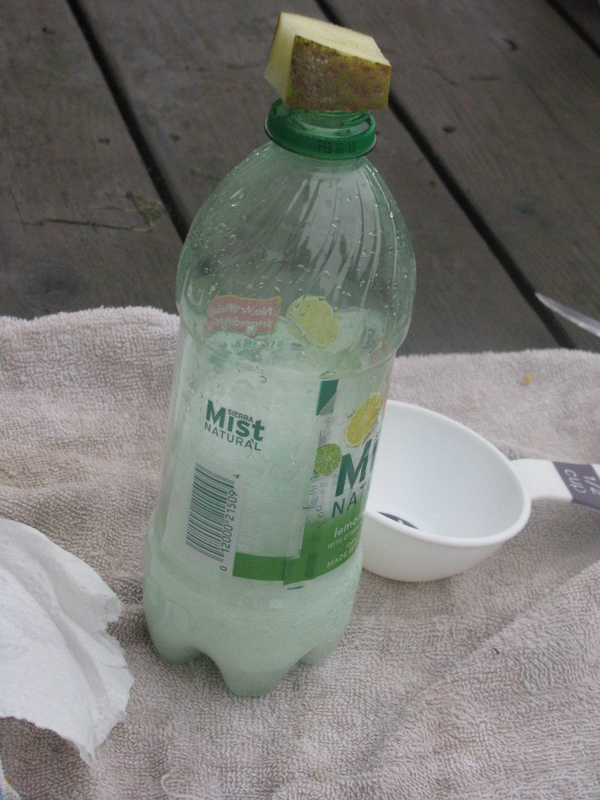 We let it dry, added more layers, dry some more...Then we let 'er rip! 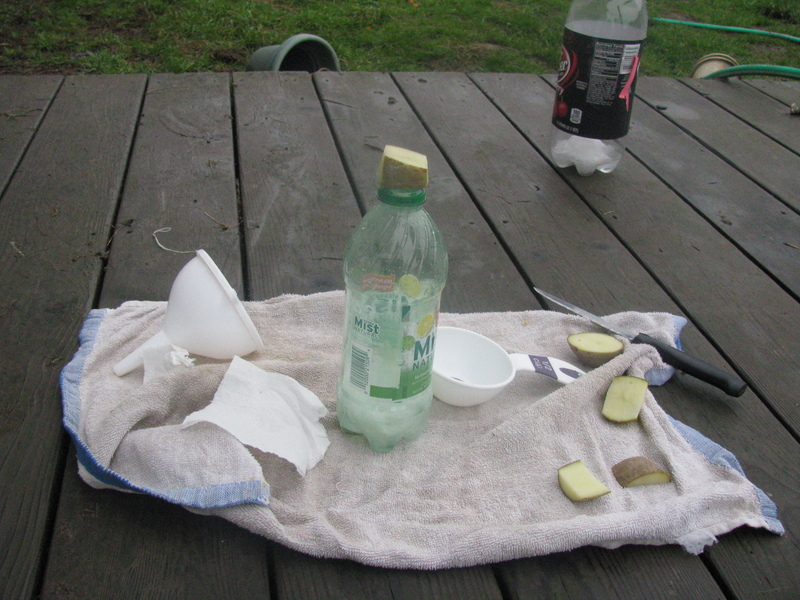 The kids set it up outside in our yard and carefully poured the ingredients in. 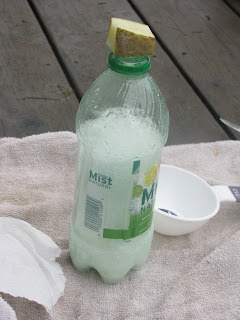 We all stood back and watched it spew out fizzy, red bubbles. This was a hit! They did it over and over, until the paper started to disintegrate, and the poor volcano we worked on started to look a little worse for the wear. We're learning all about Australia this week for our homeschool group's 'Country Report Night.' So what better way to keep all the great information we learned than in a lapbook?!! Inside Hulk's lapbook. His favorite topic was the boomerang and how the Aboriginies used them. How can you study Australia without delving into the amazing animals that live there? Here are a few of their animal cards. We wrote all kinds of interesting facts on the back of each card. Inside Sparkle's lapbook is her map and diagram of what comes from Australia. 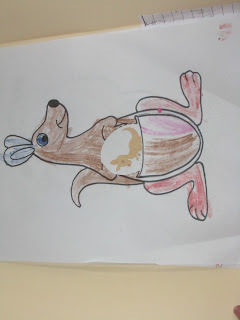 And her cute kangaroo with a little joey that slides in her pouch. My oldest did a more official report rather than a lapbook, but that didn't stop her from jumping in and getting creative with dot art. It was a fun week learning about the land Down Under. There is so much about this amazing country/continent. A week on the Great Barrier Reef alone would be cool to study. 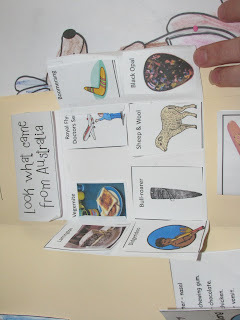 *Most of the printables seen here are from a package called 'Continental Little Hoppers:Australia' From Teacher Book Bag. I bought mine at currclick.com. The other printables are free at homeschoolshare.com. I'm a homeschooling mommy to 4-my duckies. We learn, grow and laugh all day. There's chaos, glue on the floor and somebody's banana peel on my chair, but that's ok. We're together and I wouldn't have it any other way. My husband is my best friend and is *my Sam* every day. Together we place our hearts in our loving Savior.